Healthy diets and cravings somehow go hand in hand and we are certain no one is an exception. If you are struggling to find keto recipes that satisfy your craving for cookies or bars without compromising ketosis, you are looking right where you should be. We have very carefully assembled some of the best cookies, bars and brownie recipes out there that guarantee refined sugar-free and low carb. These are also great for those who are looking for clean eating dessert and snack recipes. These recipes are family-friendly and guilt-free. Also, be sure to check out my review of the best Keto Bars for convenient low carb snacking that won’t kick you out of ketosis. Using the ever famous fathead dough method that is the ideal Keto cheat code, this mouth watering cookie is going to be your favorite! Find the recipe here. The perfect low carb chocolate chip cookie recipe out there. So addictive that you will end up making them over and over again. You will find this recipe at Fat For Weight Loss. As the name suggests, with only 3 simple ingredients, this keto sweet bar recipe literally spells out indulgence. 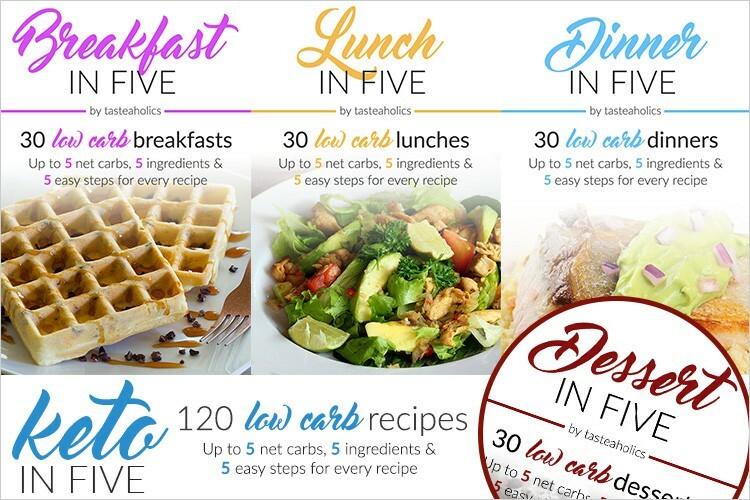 Looking for simple 5-ingredient recipes to cover your keto breakfast, lunch, dinner, and even dessert? We highly recommend Keto In Five. Give it to me now! Gluten free, low carb and high fat, this Ketogenic version of the humble seven layer bar will be sure to satisfy those hunger cravings. The ultimate LCHF brown butter chocolate chip cookie recipe, this will leave you wondering, why you never tried this before. A super healthy version of the Pecan Pie Fudge, this recipe will save you especially when you get hit with a craving for the first week of keto. Get the recipe from These Wild Acres. Vegan, gluten-free and keto yet again! This simple no bake coconut cookie recipe is filled with healthy ingredients and promises sugar-free deliciousness. Find out how to make these coconut delights at Whole New Mom. A typical fancy lemon bar that is sure to make you drool, this recipe is super quick to put together at a moment’s notice and will never fail to please. You will find this recipe at Fit Mom Journey. Cookies should be easy to bake and scrumptious. This is the simplest low carb cookie recipe you will probably ever make, and yet so satisfying. Get the recipe at Divalicious Recipes. Vegan keto foodies rejoice. These brownies are the perfect no-bake indulgence you’ve been waiting for. And no, this is not made using avocado. We love avocados, but let’s face it, avocado brownies are just not meant to be, are they? So go ahead and try this nutritious dairy free, gluten free, no avocado brownie recipe from Pretty Pies. A great snack idea for you and your entire family. Yes, your kids will love these healthy cookies. And not just because it won’t cause them to crash down after a sugar hit as the store-bought cookies do. Get the recipe from The Soccer Mom Blog. Macaroons are not a thing of the past when you can easily make them yourself at home. Forget the sugary ones at your local bakery, and make these instead. The recipe is by Aussie Keto Queen. This keto cheesecake bar is heavenly with an almond flour crust and a nice helping of cream cheese filling along with pecans of course. Head over to Spinach Tiger to get your hands on this recipe. Chocolate and peanut butter are always a perfect combo, especially if you’re using sugar-free keto friendly chocolates. And of course, you’ve got to love that it’s no-bake. Get the recipe from Two Sleevers. You may already suspect that keto pecan pies are a favorite in this roundup. But for good reason. Get the recipe from All Day I Dream About Food. Here is one more keto chocolate chip cookies recipe you won’t want to miss out on. Get the recipe at Moscato Mom. And that’s a wrap. Hope you found a few Keto cookies and bars recipes to enjoy guilt-free. If you loved this roundup as much as we do, share or save this PIN for later.